U.S. takes one step forward with Mexico, one step back with China. President Trump is considering increasing proposed tariffs to 25% (from 10%) on $200 billion in Chinese imports, according to news reports. This latest development is likely a negotiation tactic for the U.S., but it’s a step back from encouraging news about trade talks over the past few days. 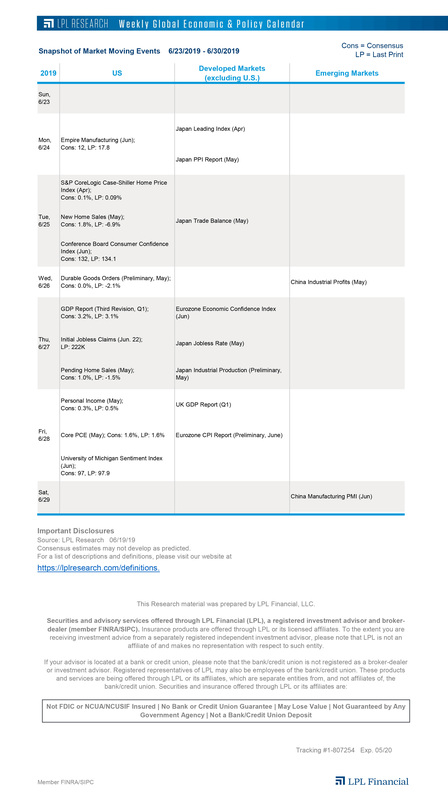 While we believe China and the U.S. will eventually reach an agreement on trade, any trade-related headlines could spur market volatility. Elsewhere, the U.S. and Mexico are said to be close to a deal on rules for auto sales under the North American Free Trade Agreement (NAFTA). An agreement would help ease trade tensions, as Trump has threatened to impose tariffs on imported cars. Fed rate decision. We expect the Federal Reserve (Fed) to announce that it will keep its benchmark interest rate unchanged–aligning with fed funds futures‘ 82% probability–at 2 p.m. ET today. However, language in the Fed’s statement could provide clues on the economy’s health and the future path of monetary policy. The Fed could possibly insert the phrase “for now” in the statement, a nod to Fed Chair Jerome Powell’s Congressional testimony two weeks ago (where he emphasized the flexibility of the Fed’s monetary policy plans). The Fed could also remove “the stance of monetary policy remains accommodative,” a change that markets could interpret as hawkish. ADP employment data shows strong job growth. An ADP employment report for July showed that U.S. companies added 219k jobs in July, higher then consensus estimates of 186k and signaling that the non-farm payrolls report scheduled for Friday could top expectations. Top tweets from LPL Focus 2018. We are thankful for so many meaningful discussions with LPL advisors about partnership, growth, and innovation during our flagship Focus 2018 conference held July 29-July 31 in Boston. We are excited to share some of our favorite tweets from the conference, beginning with highlights from our Managing Director, Investor and Investment Solutions and Chief Investment Officer Burt White’s mainstage presentation. Check out the post later today on the LPL Research blog.